Extern users, who are not working via the Outlook-Login with InLoox, can be added to the database by using the InLoox contact feature. This features helps to give partners, customers or freelancer access to a specific InLoox project. 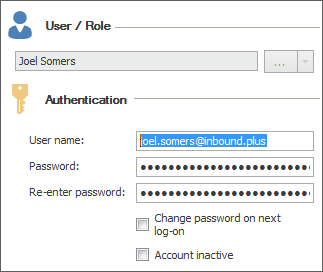 You can add extern users to InLoox PM or InLoox now by creating a new contact and assigning an InLoox user license. You have an unused InLoox user license. You have activated the automatic assignment of user licenses in the InLoox options. 1. Open the InLoox options to activate the automatic user license assignment. Therefore click on File and then on InLoox PM or InLoox now options. 2. In the InLoox options click on License Key and then on User Licenses. This area provides an overview over all available user licenses: InLoox PM Outlook User, InLoox PM Web User, and InLoox PM Universal User. 3. Put a check at the field Automatic user license assignment. 4. Afterwards, click on Apply and OK to save your changes and to close the InLoox options. To assign an InLoox user license to an extern user, you have to create a new InLoox contact or you just open the already existing InLoox contact. Go to the InLoox People area to create a new contact or to open the already existing contact. 1. Open the InLoox now or InLoox PM tab and click on People. 2. If the person is already in your InLoox address book, just double-click on the contact to open it. Otherwise click on New Contact to create a new contact. 3. A new window opens. Here you enter all important contact details (see chapter Create a new contact). If the contact is already in your address book, you can skip this step. 4. In the Licenses area in the ribbon you can see how many unused user licenses are left. 5. Click on the button Allow Login to add the person to InLoox and to assign a user license. If the person should be allowed to create projects by themselves, activate the button Create Projects. If you want to assign all writing- and reading permissions to this contact, click on Administrator (the contact is now an InLoox administrator). 6. To save your changes click on Save and Close. Now, the contact automatically receives its InLoox user license. Additionally, you can edit the persons’ user-based permissions in the InLoox options. For more information see Set user permissions. 7. The following procedure differs between InLoox now and InLoox PM. 7.1 InLoox now: The user receives an invitation mail to InLoox now!. He clicks on the attached link and is forwarded to InLoox Web App. There he creates a password and logs-on to InLoox Web App. Afterwards, he can click on the button Outlook Client in the Web App to download the local InLoox client. Therefore click on File and open the InLoox PM options. Click on Permissions and select the new user in the user-based permissions. Then click on Edit. A new window will open. In the Authentication area you can create the authentication for the new user. Afterwards you click on OK to close the window. To safe your changes and close the InLoox options click on Apply and OK.
← Invite new users to InLoox now! Add extern users to InLoox • Copyright 1999-2019 © InLoox, Inc. All rights reserved.